WTF: What's "Mom" doing, and why does she want the world to know about it? I’m pretty sure this isn’t what Al Gore envisioned when he created the Internet. 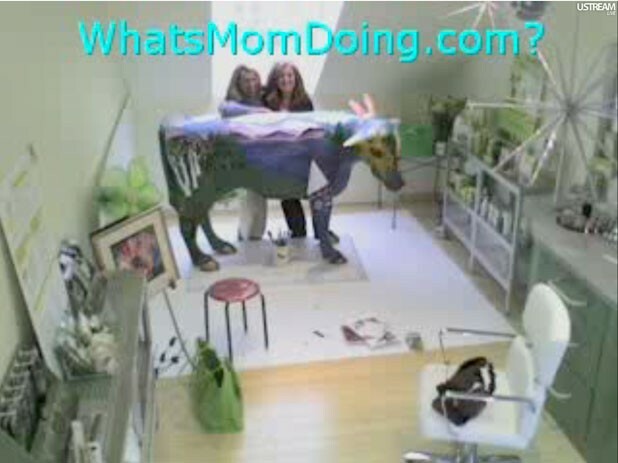 WhatsMomDoing.com is Cheryle Jimmo’s “brilliantly crazy” brainchild: a salon and boutique in Burlington that films its entire operation and broadcasts it live on the web. Visitors to the website can watch Jimmo, her customers and whoever else shows up cut hair, answer phones, even take tap-dancing lessons, all on their computer screens. It’s kind of like a reality show without the alcohol and low self-esteem. Like many locals, I took my first virtual visit after noticing the Battery Street business’ sign, which reads only: “WhatsMomDoing.com.” A smaller sign on the door cautions: “Attention: continuous live filming.” All this got me wondering: Who is Mom? What is she doing? Is my mom in there? And finally, do I even want to know what this mom is up to? Jimmo, the owner of WhatsMom Doing.com, hopes that people like me do want to know — that’s the whole idea. Since the salon’s doors opened in November, WhatsMomDoing.com has received more than 100 hits per day. Even so, some mystery still surrounds the shop near Burlington’s waterfront. “I don’t know … I guess it must be a place for moms to go and … do mom things?” ventured one Burlingtonian. I asked before I checked the place out. I figured the store might house a kind of emergency help line for stressed-out mothers who need casseroles baked or laundry done. The salon offers typical services of eyebrow waxing, hairstyling and makeup consultation, but is unusual in many respects. All products are chemical free and cruelty free, and half the space is reserved for individuals who want to showcase their own businesses. Of course, it’s the live-broadcast, 24/7 thing on the Internet that really sets WhatsMomDoing.com apart. Many salon goers may feel that live-streaming their haircut or waxing experience online is unnecessary, to say the least. But there’s something intriguing about the idea. In our hyperconnected society, and given the popularity of reality TV, YouTube, video chat and other voyeuristic ventures, this could be the logical next step. Call it the Too-Much-Information Age. When you call the salon to make an appointment, you can watch Jimmo walk over and pick up the phone. If you’re in her chair debating whether to get bangs, you can ask your friend at home to tune in … and weigh in. If you want to be sure Jimmo is the right stylist for you before coming in, you can check out her work on other customers. One camera in the salon is aimed at Jimmo’s workspace. The other camera focuses on the salon’s “community space,” which local professionals can use to promote their work. Currently, a woman is painting a large model of a cow for an upcoming project. In the future, Jimmo hopes to schedule “Tap Dance Tuesdays,” when viewers can tune in and learn how to tap dance along with her. She also plans to bring in palm readers, Reiki practitioners, massage therapists, jewelry makers and more. “I want things that are silly, educational, theatrical … a new cast of characters every day with the people coming in doing their promotions,” says Jimmo. Helping others develop their vision is important to her. Jimmo, a friendly, energetic and slightly eccentric 50-year-old, is a graduate of O’Brien’s School of Cosmetology who has had two previous conventional salons. She doesn’t seem to mind that some people don’t quite get her out-there business model, or are confused by its name. The latter came about when she mentioned to her husband how nice it would be for her grown daughters always to be able to see what mom is doing. “And my husband said to me, ‘I think that’s your name,’” Jimmo says. In the future, she hopes to open an identical shop in Boston for those daughters to run. Jimmo says she accepts that people put off by the live filming aren’t going to become her clients. But she is confident her salon will catch on in the long run.